Broadway Video is an American multimedia entertainment studio founded by Lorne Michaels, creator of the sketch comedy TV series Saturday Night Live and producer of other television programs and movies. Broadway Video was founded at 1619 Broadway, New York, also known as the Brill Building, where it still has offices. Broadway Video later “prospered” by moving into home entertainment, acquisition, and international syndication. With offices in New York and Los Angeles, the company has continued to develop films and TV programming. Its sitcom, 30 Rock, ran for seven seasons between 2006 and 2013. Besides SNL, its current TV productions include The Tonight Show Starring Jimmy Fallon, Late Night with Seth Meyers, Mulaney, Portlandia, The Awesomes, Man Seeking Woman, and The Maya Rudolph Show. The company’s Above Average Productions distributes its own original digital shorts, and those of others, on one of YouTube’s leading comedy networks. Broadway Video Enterprises distributes the company’s library and develops branded entertainment. Broadway Video Ventures invests in emerging technology, media, and entertainment companies. Broadway Video Television develops and produces primetime and late night programming. Its flagship show, Saturday Night Live, where Michaels remains Executive Producer, begins its 43rd season in September 2017. Michaels also has served as Executive Producer of NBC’s Late Night franchise for more than two decades – producing Late Night With Conan O’Brien (1993–2009), Late Night With Jimmy Fallon (2009–2014), and Late Night With Seth Meyers (2014–present). In 2014, Michaels took on the role of Executive Producer of The Tonight Show Starring Jimmy Fallon. Since 2011, Broadway Video has produced Portlandia, the Peabody-winning IFC series created by Fred Armisen, Carrie Brownstein, and Jonathan Krisel. The show, which has been renewed for a fifth season, is distributed in 91 nations. The company’s animated series, The Awesomes, created by Seth Meyers and Mike Shoemaker, premiered on Hulu in 2013 and is now in its second season. Mulaney, set to air on Fox in the fall of 2014, stars comedian John Mulaney, Slated to air on the FXX channel is Man Seeking Woman, based on Last Girlfriend on Earth by Simon Rich. Ordered by IFC for 2015 is Documentary Now, created by Fred Armisen, Bill Hader, and Seth Meyers.The Maya Rudolph Show, a variety show starring the former SNL cast-member, aired on NBC on May 19, 2014. 30 Rock is currently in syndication. Michaels has developed and produced such films as Mean Girls (2004), Enigma (2001), Tommy Boy (1995), Lassie (1994), and Wayne's World (1993), among other titles. His SNL Studios productions have included The Ladies Man (2000), Superstar (1999), and A Night at the Roxbury (1998). Michaels’ co-productions with John Goldwyn include The Guilt Trip (2012), MacGruber (2010), and Baby Mama (2008). Currently in production are Staten Island Summer, written by Colin Jost and directed by Rhys Thomas and a Goldwyn-Michaels comedy based on the 1997 Loomis Fargo Robbery in North Carolina, due to feature Owen Wilson, Zach Galifianakis, Kristen Wiig, and Jason Sudeikis. Broadway Video revived the Above Average name in June 2012, when it created a division for producing digital content. The company distributes original comedy shorts via its website, AboveAverage.com, and the Above Average network on YouTube. As of 2014, the network featured over 50 channel partners, including such comedy troupes as the Upright Citizens Brigade, The Lonely Island, Good Neighbor, POYKPAC, and BriTANicK. Its videos frequently feature current and former Saturday Night Live cast members such as Vanessa Bayer, Kristen Wiig, Jay Pharoah, Jason Sudeikis, Taran Killam, and Kate McKinnon as well as up-and-coming comedians. Among the network’s most viewed web series are 7 Minutes in Heaven with Mike O’Brien and "Waco Valley," an animated series that received a pilot order from the Comedy Central network. Above Average Productions also creates promotional entertainment for client companies, including Hasbro, Fox Digital Studios, Random House, Sprint, NBC, Conde Nast Entertainment, and Nickelodeon. In October 2015, Above Average partnered with SNL co-head writer Bryan Tucker to launch a new sports comedy brand, The Kicker. The Kicker creates original sports comedy videos, articles, images, and digital content that are similar in tone to that of Above Average. Broadway Video Enterprises manages the distribution and licensing of Broadway Video Entertainment’s properties. The company’s library contains over 1,000 hours of programming including Saturday Night Live, Portlandia, The Awesomes, Above Average webisodes, The Kids in the Hall, The Best of the Blues Brothers, All You Need Is Cash, and musical performances by Neil Young, Randy Newman, and The Beach Boys. The division has syndicated episodes of "Saturday Night Live" in over 200 countries and has licensed the "SNL" format in Italy, Spain, Japan, Korea, Brazil, Russia, Canada, Mexico, France, Turkey and Germany. The SNL consumer products line offers several hundred items, including over 100 DVDs. The Enterprises division has also engineered advertising and promotions for brands such as AT&T, Verizon, Old Navy, and Jeep. Broadway Video Ventures invests in and partners with emerging media, entertainment, and technology firms that compliment the company's existing enterprises. Investments by Broadway Video or its strategic partners include Nerdist Industries (acquired by Legendary Entertainment), Zefr, StrikeAd, Evenly (acquired by Square, Inc.), and Optimal (acquired by Brand Networks). Ventures also develops and launches new businesses, including the digital comedy subsidiary Above Average Productions. Broadway Video Post-Production specializes in the completion of television, film, music, digital, and commercial projects. The division offers design and editorial services, as well as suites for offline editing, online finishing, color correction, compositing, sound design, sweetening, scoring and mixing. Besides working on Broadway Video’s own productions, the division has collaborated with organizations including NBCUniversal, MTV, VH1, Showtime Networks, USA Network, Discovery Channel, Nickelodeon, American Express, Walmart, and Procter & Gamble. "Saturday Night Live" has won 40 Primetime Emmy Awards and currently holds the title for most-nominated show, with 187 Emmy nominations as of July 2014. "SNL" has been honored twice, in 1990 and 2009, with a Peabody Award and was inducted into the Broadcasting Hall of Fame. "Portlandia" has won two Emmys and received six nominations, as well as a 2012 Peabody Award. "30 Rock" won 16 Emmys and received 103 nominations. It also won a Peabody Award in 2007. "Late Night with Conan O’Brien" won one Emmy and received 28 nominations. "Late Night with Jimmy Fallon" won one Emmy and received six nominations. "The Kids in the Hall" received three Emmy nominations. Lorne Michaels’ honors include one personal Peabody Award, 13 Prime Time Emmy Awards, induction into the Television Academy of Arts and Sciences Hall of Fame, and the Mark Twain Prize for American Humor. Broadway Video’s headquarters are at the Comcast Building. Broadway Video’s principal offices in New York are located in the Comcast Building at 30 Rockefeller Plaza in New York. 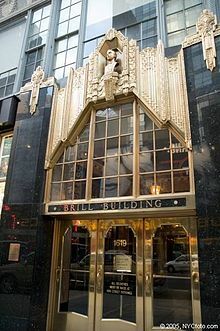 Broadway Video Post-Production and Above Average Productions are based in the Brill Building. Principal offices in Los Angeles are located at 9401 Wilshire Blvd., Beverly Hills, California. Broadway Video Film also has offices on the Paramount Pictures lot in Los Angeles. Below is a list of audio, film, and television projects in which Broadway Video has been involved. Lassie 1994 Production Produced with Paramount Pictures. At the time, Broadway Video owned the Lassie franchise, which is now owned by DreamWorks Classics/DreamWorks Animation (via Universal Pictures/NBCUniversal). Frosty Returns 1992 Production/Distribution Special, Produced with CBS and Bill Melendez. At the time, Broadway Video owned the pre-1974 Rankin/Bass Productions television library (Frosty Returns being a pseudo-sequel to Frosty the Snowman), which are now owned by DreamWorks Classics/DreamWorks Animation (via NBCUniversal), along with Frosty Returns. ^ Weingrad, Doug Hill & Jeff Weingrad (1987). Saturday Night: A Backstage History of Saturday Night Live (1st Vintage Books ed.). New York: Vintage Books. ISBN 0394750535. ^ Lafayette, Jon (15 April 2014). "NBCU Jumps Into Digital Video With Advertisers". Broadcasting and Cable. Retrieved 6 July 2014. ^ "Broadway Video - Divisions". BroadwayVideo.com. Retrieved 7 July 2014. ^ "Internet Movie Data Base". IMDB.com. Retrieved 6 July 2014. ^ "Portlandia Seasons 4 and 5 Coming in Early 2014, 2015". IFC.com. ^ Rose, Lacey (19 September 2013). "Seth Meyers' 'The Awesomes' Renewed at Hulu". The Hollywood Reporter. Retrieved 7 July 2014. ^ Andreeva, Nellie (6 May 2014). "Fox Ups Order For Multi-Camera Comedy 'Mulaney' To 16 Episodes, May Be Done With Comedy Pickups". Deadline Hollywood. Retrieved 7 July 2014. ^ "FXX Orders Jay Baruchel Starrer 'Man Seeking Woman'". Deadline Hollywood. 2 July 2014. Retrieved 7 July 2014. ^ "SNL CAST MEMBERS REUNITE FOR AMERICAN DOCUMENTARY". IFC.com. Retrieved 7 July 2014. ^ Hare, Breeanna (20 May 2014). "'The Maya Rudolph Show': What's the verdict?". CNN.com. Retrieved 7 July 2014. ^ "WGN America - "30 Rock"". WGNAmerica.com. Retrieved 7 July 2014. ^ "Omni TV - Shows - "30 Rock"". Omnitv.ca. Retrieved 7 July 2014. ^ "Internet Movie Data Base". Imdb.com. Retrieved 7 July 2014. ^ Patten, Dominic (20 August 2013). "Ashley Greene Joins Lorne Michaels-Produced 'Staten Island Summer'". Deadline Hollywood. Retrieved 7 July 2014. ^ Anderton, Ethan (25 June 2014). "Jason Sudeikis to Reuinte with Kristen Wiig in 'Loomis Fargo' Heist". FirstShowing.net. Retrieved 7 July 2014. ^ Fox, Jesse David (June 5, 2012). "Broadway Video's YouTube Channel Is Above Average". Splitsider.com. Retrieved 7 July 2014. ^ Milano, Dan (1 August 2012). "YouTube Getting 'Above Average' Content with 'SNL' Stars". ABCNews.com. Retrieved 7 July 2014. ^ "About Above Average". YouTube.com. Retrieved 7 July 2014. ^ "Above Average Featured Faces". AboveAverage.com. Retrieved 7 July 2014. ^ Hurwitz, Daniel (10 January 2014). "Inside look at Lorne Michaels' Above Average YouTube channel". USA Today. Retrieved 7 July 2014. ^ Taylor, Jordyn (12 June 2014). "The New Road to Comedy Superstardom". New York Observer. Retrieved 7 July 2014. ^ Evans, Bradford (13 January 2014). "Comedy Central Orders a Pilot Based on Above Average's Animated Series 'Waco Valley'". Splitsider.com. Retrieved 7 July 2014. ^ Wright, Megh (28 October 2015). "Check Out 'SNL's Bryan Tucker and Above Average's Sports Comedy Website 'The Kicker'". SplitSider. Retrieved 4 February 2016. ^ "Enterprises". BroadwayVideo.com. Retrieved 7 July 2014. ^ "SNL Canada? Quebec To Get Short-Lived Version Of Show". Huffington Post. May 8, 2013. Retrieved 7 July 2014. ^ "'Saturday Night Live' lands Internet deal in China". Entertainment Weekly. Associated Press. January 2, 2014. Retrieved 7 July 2014. ^ Lopez, Michael (April 1, 2013). "Eugenio Derbez Planning To Bring 'SNL' To Mexico". Huffington Post. Retrieved 7 July 2014. ^ Okelana, Jimi (5 June 2011). "Saturday Night Live Japan". Axiom Magazine. Retrieved 7 July 2014. ^ Lingeman, Jake (30 March 2014). "Jeep Hides Ad in "Saturday Night Live" Skit, Sort Of". AutoWeek. Retrieved 23 July 2014. ^ "Broadway Video Ventures". BroadwayVideo.com. Retrieved 7 July 2014. ^ "Broadway Video Post Production". BroadwayVideo.com. Retrieved 7 July 2014. ^ 50th Annual Peabody Awards, May 1991. ^ 68th Annual Peabody Awards, May 2009. ^ "About the Show". NBC.com. Archived from the original on 2014-07-01. Retrieved 7 July 2014. ^ "Portlandia - Awards and Nominations". Emmys.com. Retrieved 7 July 2014. ^ ""30 Rock" - Awards and Nominations". Emmys.com. Retrieved 7 July 2014. ^ ""Late Night With Conan O'Brien" - Awards and Nominations". Emmys.com. Retrieved 7 July 2014. ^ ""Late Night with Jimmy Fallon" - Awards and Nominations". Emmys.com. Retrieved 7 July 2014. ^ ""The Kids in the Hall" - Awards and Nominations". Emmys.com. Retrieved 7 July 2014. ^ "About Lorne Michaels". NBC.com. Retrieved 7 July 2014.